The following best practices can ensure that you're making intelligent, data-driven business decisions on your big data. Whether you're analyzing customer data to improve your marketing segmentation and capital allocation, gathering data from disparate sources to create predictive models, or sorting through cyber security data to make your infrastructure more secure, the following best practices can ensure that you're making intelligent, data-driven business decisions. Before embarking on a BI project, it's important to decide on the metrics that are meaningful to your business. For instance, if you're analyzing advertising and customer data to uncover your best customer acquisition data, conversion rates and customer spending data are incredibly valuable. Eliminating extraneous data will simplify your visualizations and allow executives to focus on relevant metrics to make decisions that may change the course of a division or company. What is the end goal for the data collected? How will this data help achieve my business goals? Am I data mining or conducting predictive analysis? In order to gain actionable insights from all the data you've collected, you need a way to model the data correctly. This means avoiding common errors such as ignoring small data sources, failing to account for how calculated fields could affect your model and implementing poor naming standards. Without taking these potential errors into account, you can end up with data models that are cumbersome and confusing. Take the time to plan the goals of your analytics, especially when merging data from many different sources. Ensuring calculated fields are consistent, creating proper dimensional hierarchies that allow users to drill down into the data, and other data modeling best practices will make it far easier to model complex data. We've written before about the principles of designing better dashboards, so we won't go into too much detail here. Suffice to say, visualization is at the core of how we interact with data, particularly for non-technical users. Things like leading with the most newsworthy info and gradually working your way to background details, choosing visualizations that display the relationship between the highlighted info and the overall context, and ensuring that key stakeholders can understand the key points with a simple glance will go a long way towards improving your dashboard design. Displaying complex analytics is a challenge that requires you to make difficult decisions in regards to informational hierarchy, dashboard design, and more. Proper planning will ensure your visualization is relevant, logically ordered, and simplified so your users aren't overwhelmed. When you're evaluating business intelligence tools, there are many options to choose from. On the surface, they may seem similar in many ways, however, behind the curtains they are quite different. Many tools either focus entirely on visualization, lack the power to handle large datasets pulling from disparate sources or are unintuitive, placing additional demands on IT staff. Look for a solution that offers single-stack capabilities and is powerful enough to handle even the most complex data while still being intuitive enough for less technical users. 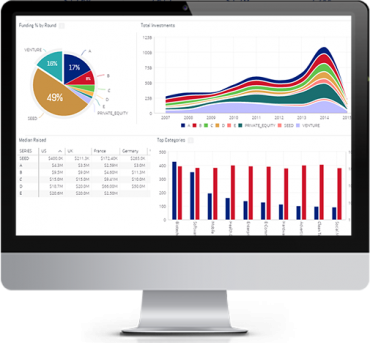 Rather than requiring separate tools for data preparation and visualization, our single-stack approach wraps an analytical database, built-in ETL, and a robust data analysis and visualization suite all into one, so you won't need any other BI tool.